Overall, UK payment volumes were up 3% in 2016 to just over 8 billion transactions. The total value of transactions made across the main UK Payment Systems during 2016 was £82 Trillion (up 10%). The Faster Payments system has, unsurprisingly, seen the greatest year on year volume growth at 14% with just over 1.4 billion payments made across it. Of these, 57% were single immediate payments (with the remainder made up of Standing Orders and future dated payments). In contrast, Cheque volumes fell 15% in 2016 thereby repeating (if not eclipsing) the fall of 13% recorded in 2015. 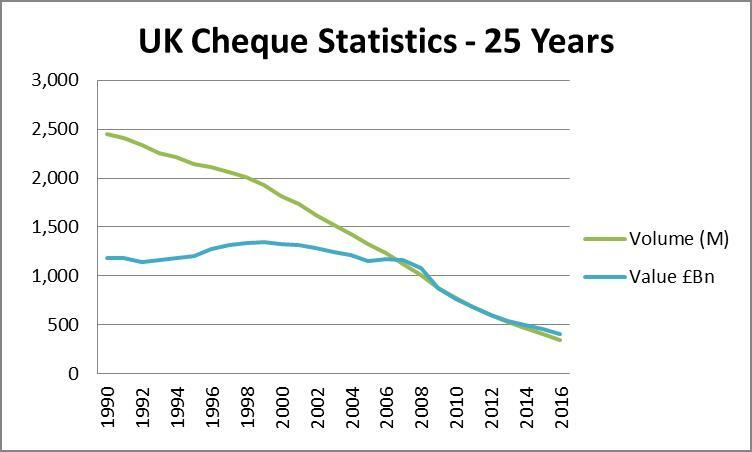 Mirroring trends elsewhere, cheque volumes in the UK have fallen 85% since 1990 with an overall value drop of two-thirds in the same time period. However, the latter is not inflation adjusted so, in real terms, the value drop is significantly more. Notwithstanding these falls, adding on the total number of credits cleared in 2016 shows that, collectively, the Banks still cleared 366 million cheques and credits (or just over 1.4 million items per working day). This is still a large number of paper based payment transactions although, if the declining trend continues at the current rate, this figure could be nearly halved within four years. In the meantime, the infrastructure backing this process remains very much a fixed cost to the payments industry with the net cost per transaction rising as a consequence. This brings to the fore the question of the future of cheques. 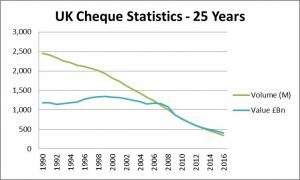 In early 2011, the then UK Payments Council proposed that cheques should be abolished by October 2018. However, these plans were dropped just a few months later following both significant opposition to the proposal and the absence of a suitable alternative to cheques being identified. Six years on, these factors are still present given a significant portion of the population are still uncomfortable using electronic means of payment and the dependency that certain trades and sectors such as charities still have on cheques. 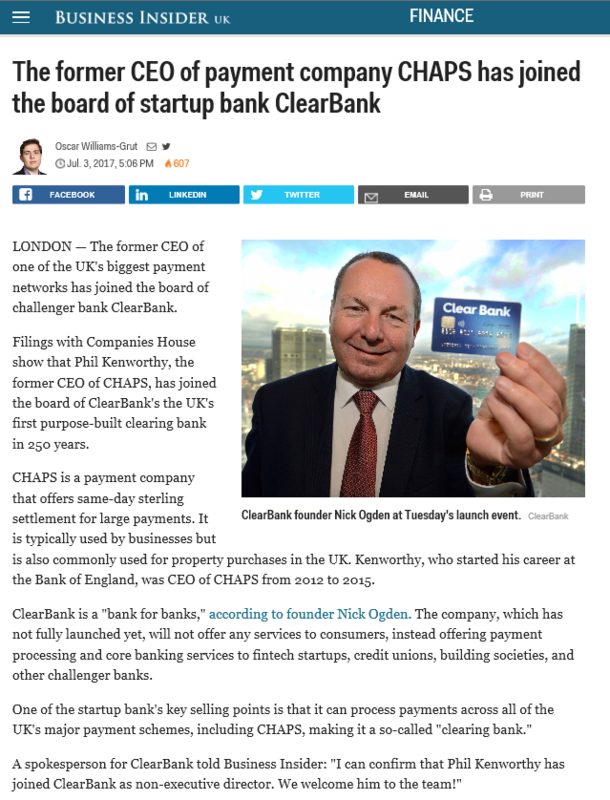 The Cheque and Credit Clearing Company subsequently announced (in 2014) plans to enhance the cheque clearing process by permitting the clearance of electronic cheque images via a new Image Clearing System (this would also cover other instruments such as bank drafts). This would also permit the current six day cheque clearance cycle to be substantially reduced. Work has continued since this time with the latest publicly available Board minutes from December 2016 highlighting that industry testing is due to take place from end May 2017. At this point however, no date has been published for the launch of the new system. It is also unclear whether this new system will be integrated into (or act as a service layer on) the New Payments Architecture recently announced as part of the new U.K. Payment Strategy published by the Payments Strategy Forum at the end of November 2016 (see here). According to Cheque and Credit Clearing, the earliest example of a handwritten cheque known to be in existence in the UK dates from 1659. Over 350 years later, it would seem that this latest development is likely to be the final swansong for a declining financial instrument that has served us well, but whose volumes in the 5-10 year timescale are likely to represent just a fraction of the UK payment volumes. As such, there may come a time when the tough decision will need to be made to discontinue their use. We are not at this point yet. However, perhaps unlike 2011, a smudge of smoke can now be seen on the very distant horizon.